Aboard the Arctic Sunrise, a working icebreaker that has sailed to the Arctic Circle, the Congo, and the Amazon Rivers under Greenpeace’s stead, EFF joined several civil liberties and environmental rights groups to send a message: no longer will we be bullied by malicious lawsuits that threaten our freedom of speech. “We have the Constitution, we have our rights, and now, we have each other,” said Greenpeace executive director Annie Leonard. 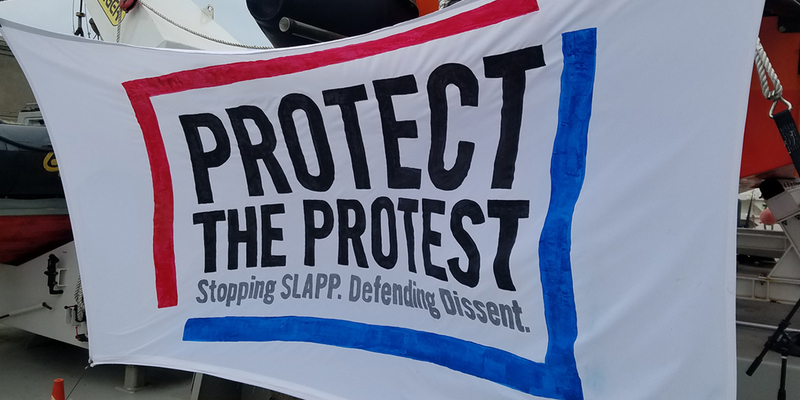 On September 5, EFF helped launch Protect the Protest, a coalition of nearly 20 organizations committed to fighting back against Strategic Lawsuits Against Public Participation, also known as SLAPPs. The coalition includes EFF, ACLU, Greenpeace, Freedom of the Press Foundation, Amnesty International, and Human Rights Watch. (Left to right) Mother Jones CEO Monika Bauerlein, Greenpeace executive director Annie Leonard, Rainforest Action Network director of communications Christopher Herrera, Wikimedia legal counsel Jacob Rogers, and EFF Civil Liberties Director David Greene discuss their civil liberties work aboard the Greenpeace ship The Arctic Sunrise. SLAPPs are malicious lawsuits often filed by large corporations and wealthy individuals to silence journalists, activists, nonprofit organizations, and those who speak truth to power. The goal is not to win a SLAPP based on legal merits. Instead, it is to abuse the court system in a way that forces a victim to spend time and money to fight the lawsuit itself—draining their resources and chilling their right to free speech. Countless Americans are hit with these lawsuits every year. From 2014 to 2016, the online technology blog Techdirt published multiple detailed articles disputing claims from Shiva Ayyadurai that he invented email. In 2016, Techdirt published an article with the headline “Here’s the Truth: Shiva Ayyadurai Didn’t Invent Email.” Months later, Techdirt founder Mike Masnick was hit with a $15 million libel lawsuit. The lawsuit and anticipated legal fees threatened Masnick’s entire business. “It affects just about everything we do,” Masnick said last week. Last year, former Weed, CA mayor Bob Hall was attacked with a SLAPP for standing up for his city’s water rights. At the launch event, Hall empathized with every SLAPP victim who feels bullied into backing down. “How many times has what’s good and right been destroyed because you don’t have the financial wherewithal to fight?” Hall said. Every SLAPP recipient speaking at the Protect the Protest launch realized that they were a lucky minority: while many SLAPP victims are eventually silenced by crushing legal fees and intimidation, the men and women on stage found lawyers to fight for them, experts to help their cases, and support within their communities. For the individuals and organizations that feel alone, Protect the Protest is here to help. No longer will SLAPPs be fought in the dark. No longer will their recipients feel isolated. No longer will we defend the First Amendment without one another. If one of our organizations faces a SLAPP, Protect the Protest is committed to amplifying that wrongful attack. If our group is truly effective, said Greenpeace’s Leonard, perhaps SLAPP will no longer mean Strategic Lawsuits Against Public Participation. Perhaps it will mean Strategic Lawsuits Accelerating Public Participation. With enough resistance from us, hopefully First Amendment opponents will no longer benefit from filing SLAPPs at all and we can put an end to this entire practice that hurts organizations and individuals alike. EFF feels right at home in Protect the Protest. We’ve represented individuals facing SLAPPs, we’ve connected others with legal help, and we’ve repeatedly advocated for a strong federal anti-SLAPP law. The Internet should allow every person—no matter their income, assets, or connections in high places—the opportunity to participate in public debates. That is only possible when everyone can speak freely without the fear of legal bullying. Our constitutionally protected right to free speech carries through both online and off. As EFF civil liberties director David Greene explained at the event, this is a crucial moment for our organizations and communities to stand together. “We realized that we, the organizations that we are, have an obligation to make sure that there is a structure in place to support those who don’t always have a group around them all the time,” Greene said. Together with our allies in the Protect the Protest coalition, EFF is committed to providing that structure and support.